(CNN) -- No drawn butter will ever touch Fiona's tail. She's an extremely rare, seven-year-old "yellow" lobster. Fiona's colorful hue makes her a one-in-30 million rarity. Fiona belongs to Nathan Nickerson, the owner of Arnold's Lobster and Clam Bar in Eastham, Massachusetts, who has been in the restaurant business for 32 years. The special lobster was caught off the coast of eastern Canada last week by a friend of Nickerson. 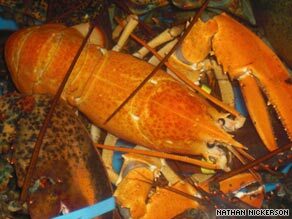 "In 57 years in Cape Cod, I have never seen a yellow lobster and I doubt that I will ever see one again," he said Thursday. Experts say Fiona's colorful appearance makes her one in 30 million. Fiona's not really yellow, but more of a bright orange, She's not quite the red color your typical lobster looks after it's been cooked. Nickerson has plans for his new ocean-dwelling friend, but it has nothing to do with the boiling pot. He said he'll keep the 1.75-pound crustacean in a viewing tank at his restaurant, hoping to draw in a few extra customers. CNN's Samuel Gardner contributed to this story.